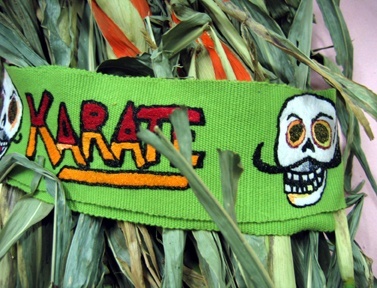 Karate is a pesticide made by Syngenta. I was struck by the name, I think because although it's a Japanese word, it's sort of like a brand name a la Kleenex in the States. It took hearing the word in Spanish to remind me it was Japanese in the first place. Funny. José Guadalupe Posada was a famous Méxican illustrator, well know for his skull and skeleton images satirizing the Méxican religious and political elite. His images and style are now popularly associated with the Méxican holiday, Day of the Dead. As we don't discuss death much in the US, I was struck by the tragi-comedy aspect of Posada's imagery.